They will love the star treatment when they receive this wonderful tower filled with gourmet treats. 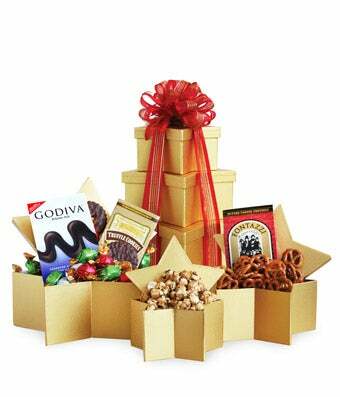 Dazzle and delight with golden star boxes filled with Lacey's cookies, butter toffee pretzels, caramel popcorn and chocolate truffles. Fun for a crowd or a party of one, this star-studded gift will add sparkle to any celebration or event!